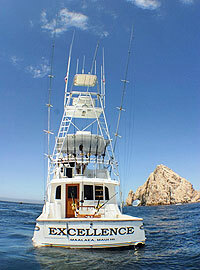 This bad boy is ready to show you an unparalleled experience in Cabo San Lucas. Tournament rigged for deep sea fishing, Excellence is captained by Joel Navarro, with over 18 years of experience in local and international waters. Capt. Joel has competed in fishing tournaments all over the world, including the Bisbees right here in Cabo, achieving a great success rate against the world's top fishermen. Excellence is a beautiful 52-foot Buddy Davis yacht, perfect not only for world-class sportfishing, but also for snorkeling tours, pleasure cruises, sunset cruises, or whatever your heart desires. Let your imagination run wild! We can customize this trip to suit your interests, don't hesitate to ask! Total luxury is the name of the game aboard Excellence, with gourmet breakfast and lunch included (see menu), air-conditioning, upscale lounge and staterooms, and of course the unlimited open bar with cocktails, beer, wine, or whatever your group enjoys. Flexible to fit your schedule. 4 Hour or 8 Hour Trips Available. 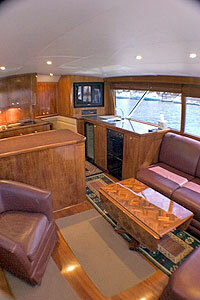 Custom quotes for multi-day charters or extended trips available - click here. Price is total cost for up to 12 People.